Visceral gout is the deposition of white urates, which are normally excreted as a white cap on well formed faeces, in various tissues. Urates are also often deposited in joints and in the kidney. This condition can occur as an individual problem at any age. Outbreaks are seen in young chicks in the first week of life (baby chick nephropathy) or in flocks suffering kidney damage, or reduced water intake. All poultry species are susceptible. The kidney damage can arise from infection with certain strains of Infectious Bronchtiis virus, exposure to some mycotoxins or inadequate water intake (often because the birds have not adapated to a new type of drinker). Baby Chick Nephropathy can be due to inappropriate egg storage conditions, excessive water loss during incubation or during chick holding/transport, or inadequate water intake during the first few days of life. Very low humidity in brooding will also increase the likelihood of this problem. The timing of mortality is a reasonable guide as to the source of the problem. In Pekin/mallard ducks the condition is almost always due to inadequate water intake, whereas in muscovy ducks it is seen in breeders allowed to continue laying for over 24 weeks without a rest. Low feed intake and growth. Chalky white deposits on pericardium, liver, air sacs, peritoneum. Similar deposits may be present in joints and are usually present in the kidney. This is based on correcting any management errors and encouraging water intake. Avoid any intentional or unintentional restriction in water intake. Sodium bicarbonate at 1g/litre water is mildly diuretic, however it could be counter-productive if water intake is in any way restricted. Careful monitoring of the conditions of hatching egg storage and incubation with a view to achieving a standard egg weight loss profile. Humidification of holding rooms and chick transporters may also be beneficial. Humidifiers in chick brooding areas are being used increasingly, especially where whole house hot air brooders are in use. Ample supplies of drinkers should be available and filled with water at house temperature prior to the arrival of the chicks. Figure 36. 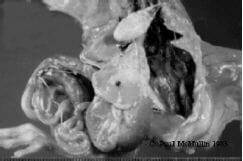 Severe visceral gout in a young chick. There are white chalky deposits around the heart (in the pericardium) on all major abdominal organs, including liver, gizzard and intestines, and even in the tissues of the thigh.